With thankfulness for life’s rich blessings and a quiet, strong faith in God, Lieut.- Colonel Cyril Boyden of The Salvation Army (aged 98 years) moved from this life into God’s tomorrow on March 23, 2019. He is deeply and wonderfully loved by his darling wife Helen, and their beloved daughter Helen and son-in-law Grant, who cherish his memory and share his faith. Born in London, England in 1920, Cyril was a WW2 veteran, serving for six years in the British Army both in the United Kingdom and in India during the Far East campaign. 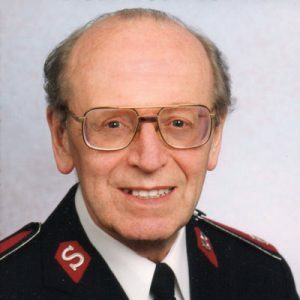 Ordained as a Salvation Army officer in 1947, he served in United Kingdom and Canada and at the Army’s International Headquarters, and will be warmly remembered by family members, Salvationists and many other friends in Canada and Britain whose lives he touched with warmth, grace and wisdom.